Capitola is a city in Santa Cruz County, California, on the coast of Monterey Bay. The population was 9,918 at the 2010 census. The original settlement now known as Capitola grew out of what was then called Soquel Landing. Soquel Landing got its name from a wharf located at the mouth of Soquel Creek. This wharf, which dates back to the 1850s, served as an outlet for the produce and lumber grown in the interior. In 1865, Captain John Pope Davenport, a whale man at Monterey, moved his operations to be near the wharf. Unable to capture any whales, he moved his operations the following year to Point Año Nuevo. In 1869, Frederick A. Hihn, who owned the property in the vicinity of the wharf, decided to develop it as a seaside resort. At first he leased the area to Samuel A. Hall and the area became known as Camp Capitola. Most authorities believe that it was Hihn who chose the name of Capitola, but they are unsure as to why he did so. Several possibilities have been asserted, one being that it was named for the heroine of The Hidden Hand, a novel by the popular author E.D.E.N. Southworth, favored by Hall's daughter Lulu. Capitola is known as the oldest beach resort on the West Coast. 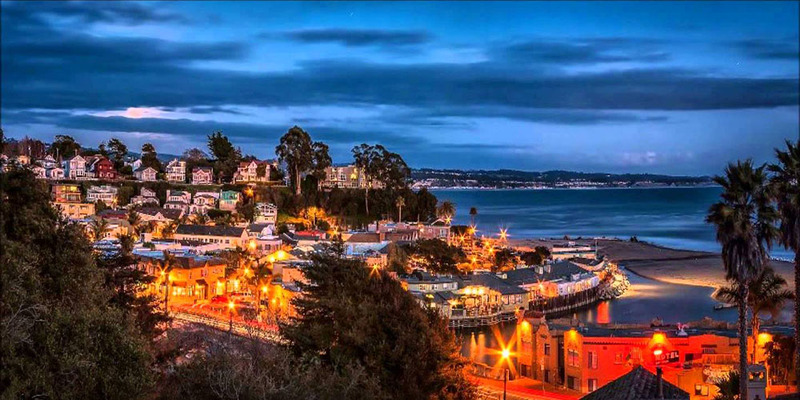 Capitola has mild weather throughout the year, enjoying a Mediterranean climate characterized by cool, wet winters and warm, mostly dry summers. Due to its proximity to Monterey Bay, fog and low overcast are common during the night and morning hours, especially in the summer.